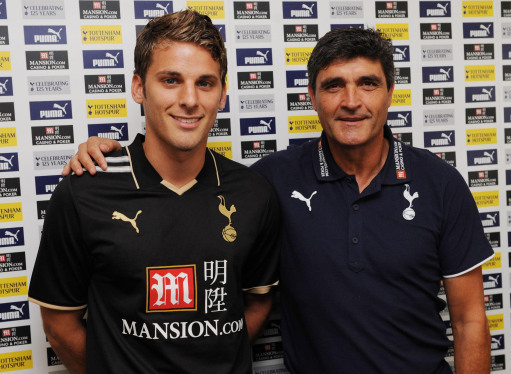 Do Spurs even need David Bentley? Why sign another overpriced midfielder? David Bentley is a good Premier League player. He’s not worth Â£15m, but that’s another story. Put it this way: none of the big four wanted him, including Arsene Wenger, who ditched him in the first place (albeit with regret). Tottenham would have been better off spending the money earned from the sale of Robbie Keane on a decent striker, or even a top-class centre-back (I don’t have any faith in the long-term fitness of Ledley King or Jonathan Woodgate). Spurs may have a very solid midfield roster now – and it’s clear than Juande Ramos is doing as much as he can to improve the squad – but they need to buy at least one striker before the season begins, possibly two if Berbatov goes to Man Utd. Otherwise Spurs fans will have to get used to 4-5-1/4-3-3 with wingers formations – and a lot of Darren Bent. Incidentally, who would have thought when Spurs boasted a striking roster of Keane, Berbatov, Defoe and Bent last season that Bent would be the one who survived? But that’s how it looks. I still think Bent can do good things in a Spurs shirt, and have a feeling that Ramos rates him more than most fans. Bent is athletic, powerful, quick and not bad in front of goal; much like Freddie Kanoute, who thrived under Ramos at Sevilla. But even if Bent has a good season, he’ll need support from somewhere. So I find it strange that Ramos is reportedly looking to add Andrei Arshavin to his squad – yet another creative midfielder. Enough already! Do you think Bentley is a good signing?